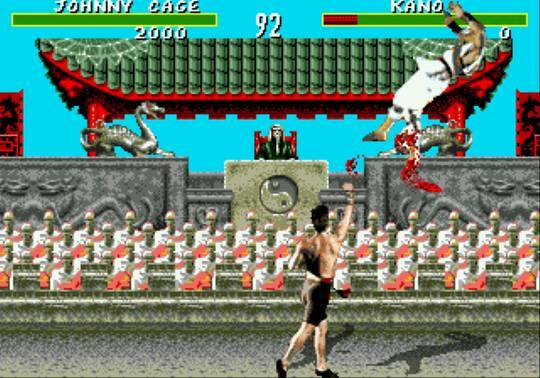 Mortal Kombat is a one-on-one fighting game that was first released in the Arcades in 1992. Your quest is to win the Shaolin Tournament for Martial Arts and stop the evil reign of Shang Tsung. It supports 1-2 players (1P vs CPU, or 1P vs 2P) and you can select from seven fighters. Each combatant has special moves as well as a gruesome fatality to finish off opponents, and while the game is rightfully compared to Street Fighter II (1991, Arcades), the combat feels totally different. Firstly, CPU opponents repeatedly charge forward and give you no room to breathe; it can be annoying for newcomers and therefore mastering your attacks is crucial. The action also adopts a slower, more methodical approach that places emphasis on blocking and counter attacking; which type you prefer is dependent on your individual play style, but it is nice to have a clear distinction between the two. The digitised graphics look fantastic, but I did occasionally notice slight lag as the engine loads the animations. The main highlight is the fatalities that are ridiculously satisfying to work out, especially when you see the uncensored versions with the blood cheat switched on! The limited roster could have resulted in an incredibly short play-through, but I love the inclusion of Endurance rounds where you need to beat two characters in a row during the same fight. It's a genius idea that spices up the gameplay and forces you to change your strategy on a whim. Likewise, the final battle against Shang Tsung is one of the most unique and clever bosses I've ever encountered as he can morph into any other character in the blink of an eye; this keeps you on your toes, using every attack at your disposal. Mortal Kombat is a great starting point for the franchise, and despite some minor niggles with the controls, it manages to stand out from the crowd due to its unique personality and well thought-out move sets. It is admittedly short on content and characters, but the solid gameplay pushes its replayability through the roof. Random trivia: A sequel called Mortal Kombat II was released on the Sega Mega Drive in 1993.